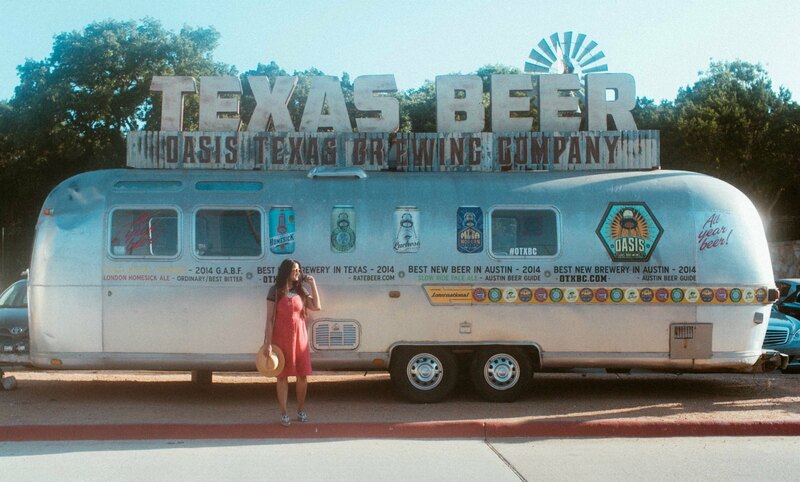 During the memorial weekend, I and my friend Lakki visited Texas. It was a spontaneous trip like every other vacation we went on. We originally contemplated on going to Mackinac Island but a planned vacation never worked for us for some reason (except for one time when we went to Orlando Disney and Universal Studios). But I am not complaining because I love adventures and I am not afraid of missing spots because it gives you room to go back to that place again. We landed in Austin on the Friday evening of Memorial weekend when we were supposed to be reached by Friday afternoon. Our flight was delayed by 4 hours (remember the “would you rather” questions I did on my Insta stories while waiting in the airport). By the time we reached our hotel after having dinner, it was late. We dozed off and that pretty much sums up our Friday. 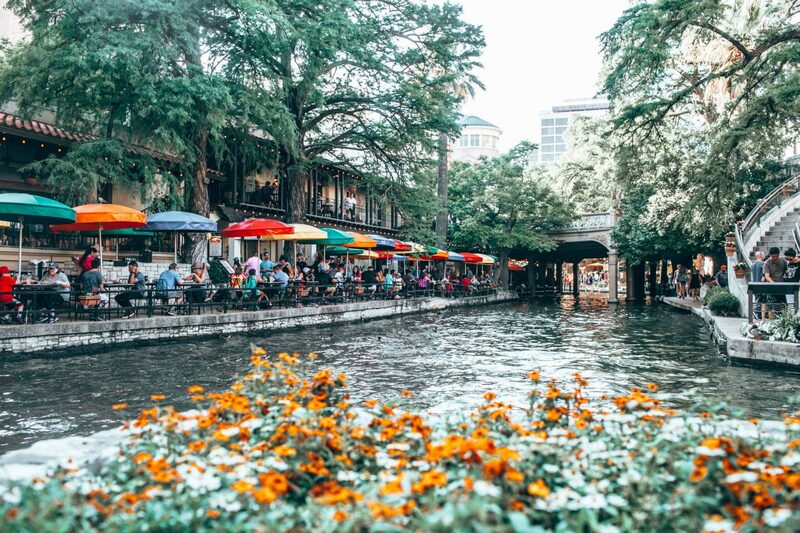 Apart from few places that our friends suggested like Riverwalk in San Antonio and 6th street in Austin we had no clue what to do and where to eat. We trusted our last-minute decisions and it turned out to be a memorable trip for us. 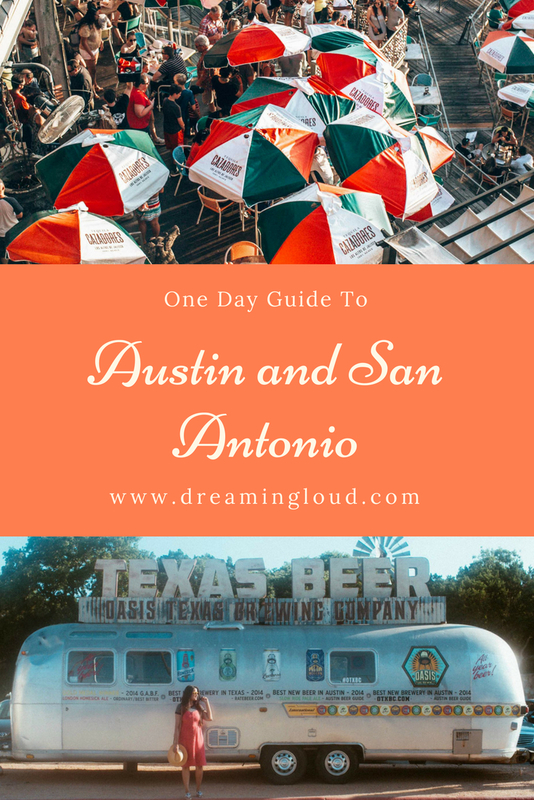 On Saturday morning first thing I did was complete my Memorial day sales blog post, look for things to do in Austin and planned our day roughly. By the time we were out, it was noon. The first place we went was Mount Bonnell. It’s a quick hiking spot located in the Covert park with incredible views of the city and Austin river. Mount Bonnell is considered as the highest point in Austin at 775 feet. As soon as we reached the top and glanced at the Austin river and 360 bridge. We realized it was the perfect spot to witness the sunrise. The cost of not researching about the place before visiting, but it’s ok because I got a chance to tell you guys and hopefully you won’t miss it when you visit. Overall It’s like a workout with rewarding views. 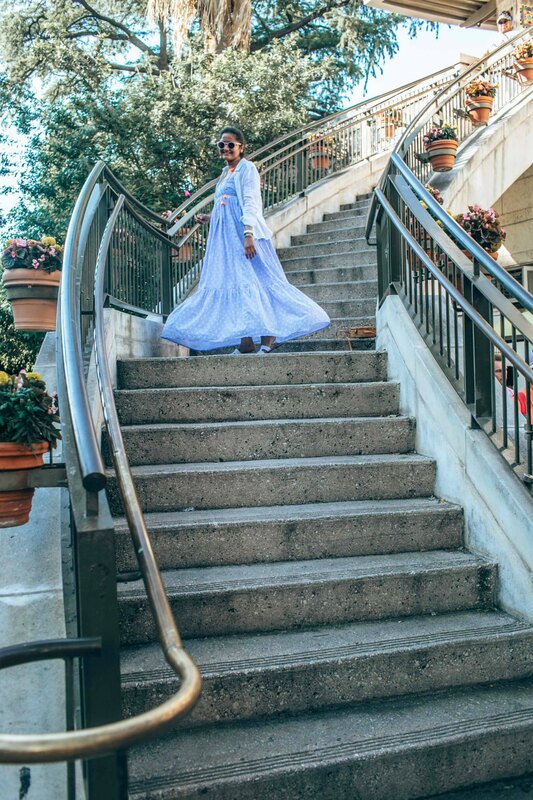 Wear comfy clothes and flats as you have to climb stairs to reach the top. Oasis at Lake Travis is an experience with good food and amazing view. It’s interesting how a restaurant turned into an incredible attraction drawing tourists and locals. 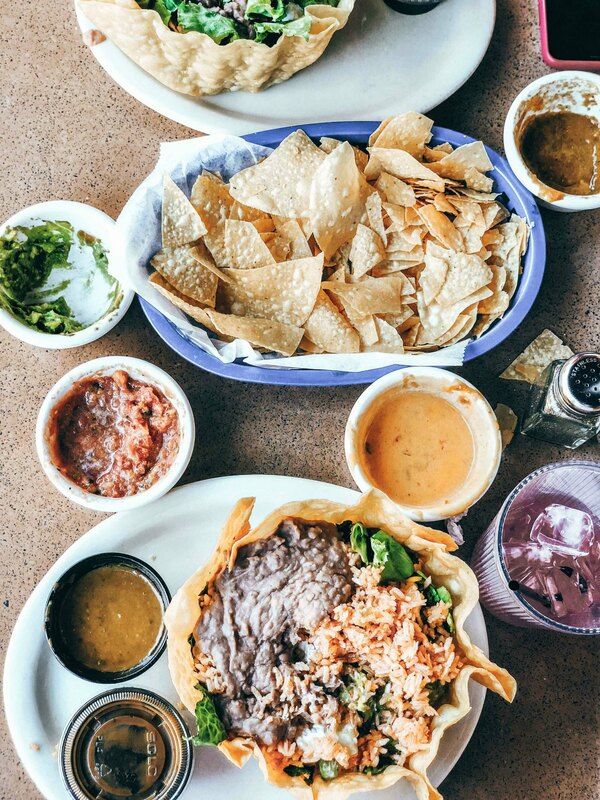 The Tex Mex restaurant is located on a cliff overlooking Lake Travis. 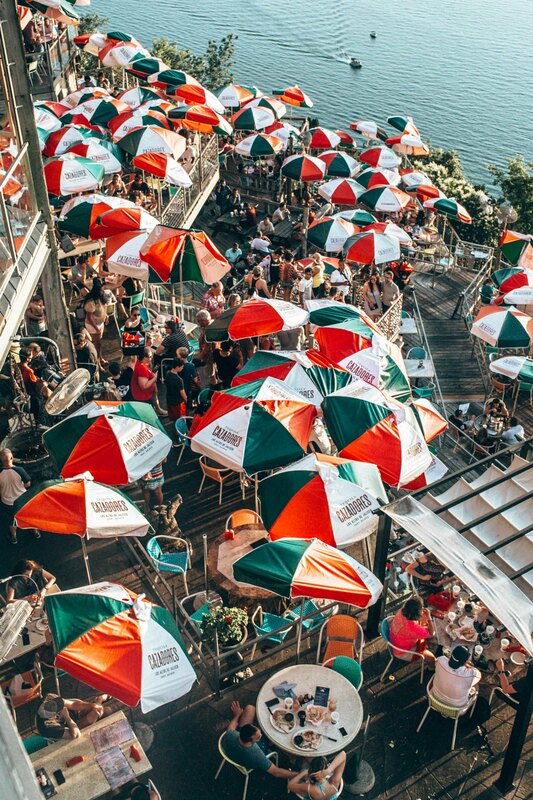 It is the largest outdoor restaurant in Austin that is spread across several levels and can seat 2000 guests. 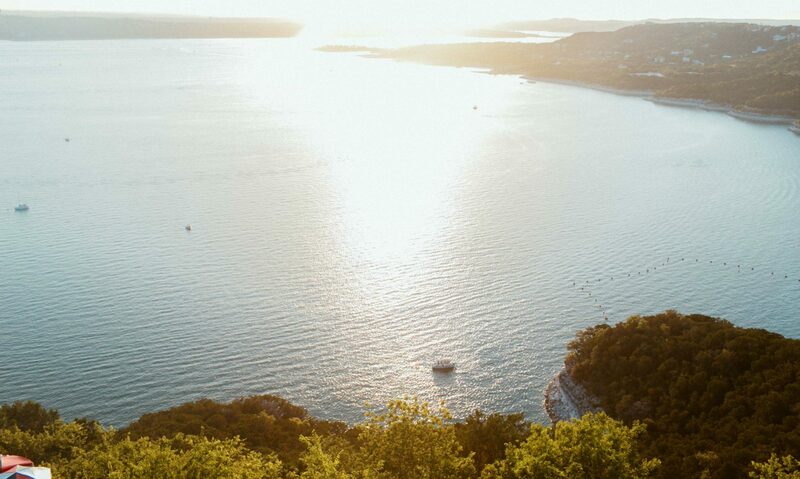 You can either dine in enjoying the live music or out looking at the spectacular Lake Travis. Oasis is also known as the sunset capital of Texas for its best sunset view. Apart from amazing food and beautiful views. 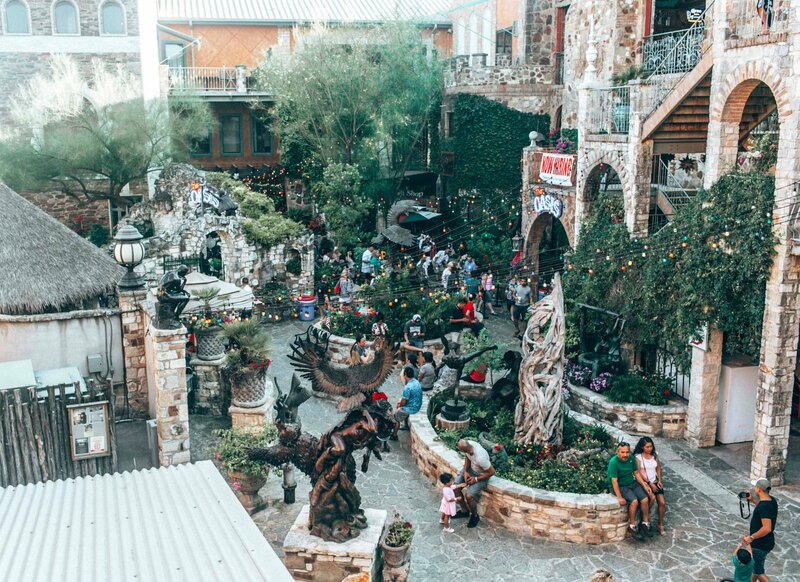 Oasis is also a destination for local shopping, candy stores, and fun events. It is filled with sculptures and lot of cute corners to take pictures. After we had an early dinner at Oasis. We went back to the hotel, planned our next day trip to San Antonio and got ready to hit the 6th street at about 9.30 PM. By the time we reached, the streets were packed with people and we had to do several circles to find parking. 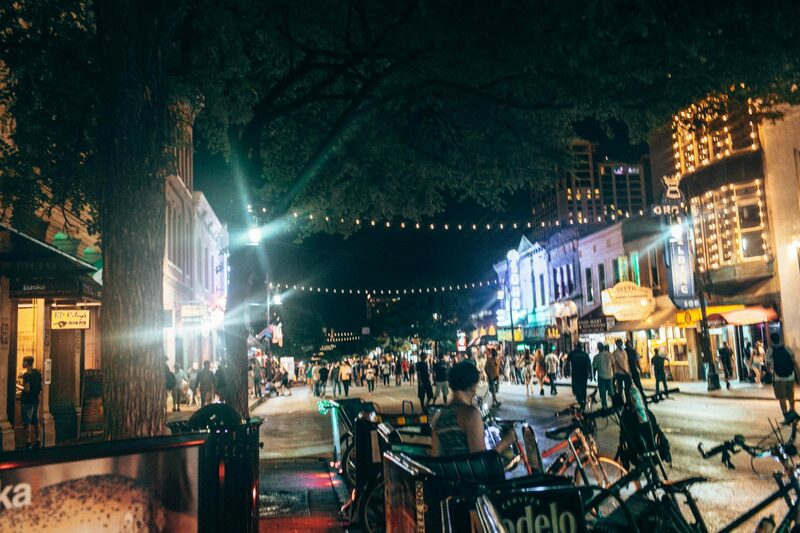 Imagine Nashville meets Austin on this stripe packed with bars and rooftop places. Almost every bar features live music. Some have dance floors and some bars have fun stuff like the Recess Arcade Bar had a collection of old-schooled video games. You can play games while drinking. We initially planned on just driving by the street just to see what’s the hype was all about as we had no plans of drinking. But we ended up parking our car and walking through the streets. It was amazing how many bachelorette parties and group events were taking place. 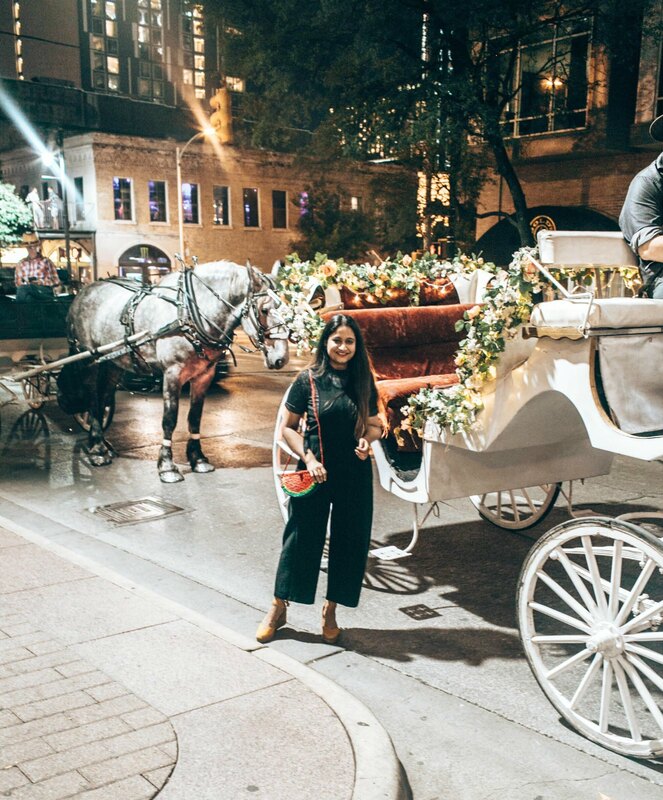 Or you can hop on one of those buggies or rickshaws to get a tour of the 6th street. You will really enjoy this place if you like bar hopping. It was too noisy for us (maybe because we were sober). We left early after walking for a while. So, I can’t really recommend bars and restaurants. 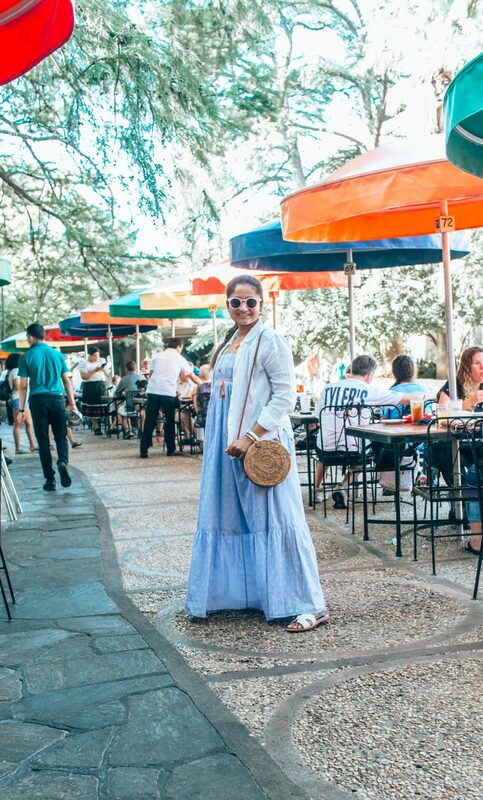 I wore a coral strappy dress with a cropped striped tee underneath to Mount Bonnell and Oasis. I love wearing shades of orange in summer. 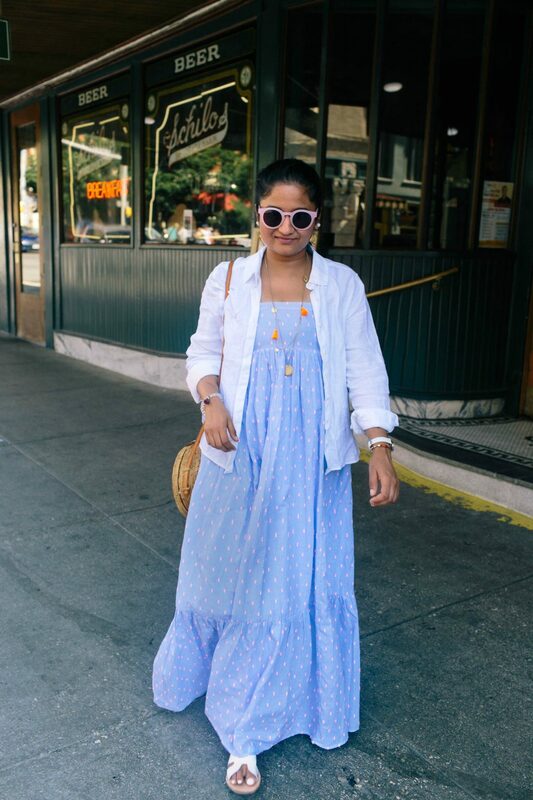 It’s easy to create a fresh, and vibrant outfit without putting much effort with it. Moreover, it looks great on summer tanned skin. 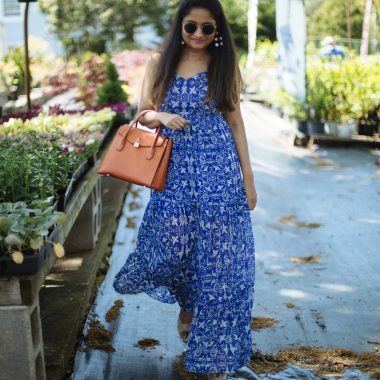 I finished the look with purple sandals (they look like navy in the picture) from Jack Rogers. This time machine is located at the entrance of the Oasis. 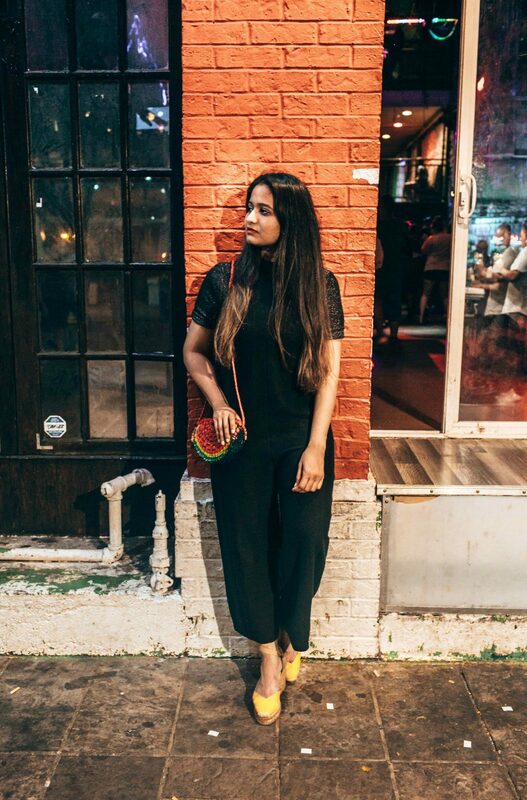 I wore a black jumpsuit with a metallic top underneath to 6th street. I usually don’t fancy wearing black a lot because whenever I wear black, I feel like I am going to work. But I wanted to wear something new, something I never tried before. So I went for a casual black jumpsuit and added some glitz with the metallic tee. 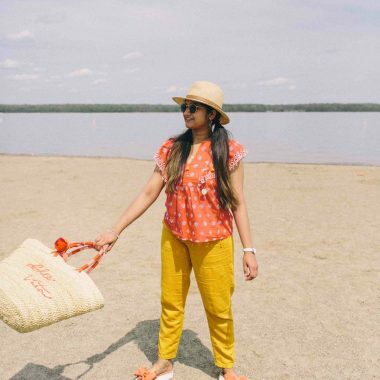 I liked how the most summary day accessories- the straw bag and the espadrille wedges went remarkably well with the night outfit. And added some color to the otherwise all-black outfit. This was after we came back to the hotel from 6th street hoping to get some food from the cafeteria but as you can see in the picture, it was already closed. I was hangry laughing. 1. 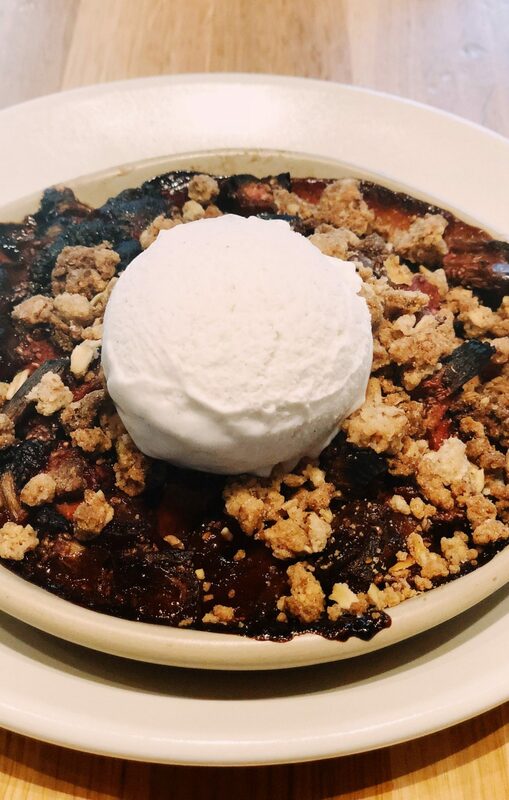 True Food Kitchen– It’s a heaven for Vegans and Vegetarians. The food was extremely delish. We found this place randomly on Yelp on the very day we landed in Austin while checking for places to eat on our way to the hotel from Aiport. I had a complete meal- drink, appetizer, entrée, and dessert after a long time. It was hands down my favorite place amongst all the restaurants we went. 3. The Oasis– As mentioned above oasis is an American Tex Mex restaurant. The food was just good but not extraordinary as the views of Lake Travis were. I really liked the tortilla chips with salsa and Guacamole better than my main course Taco Salad. The restaurant doesn’t take reservations. So the wait time to find an empty table is longer depending on what day and the time of the day you go. We went around at 5.30 PM on a Saturday evening. It was insanely crowded. But once we got the table, the food didn’t take that long and until then we had chips to fill our stomachs. 4. Jo’s Coffee – This place is known to have the best coffee in Austin. If you are into murals, don’t forget to take a picture at their “I love you so much” mural. 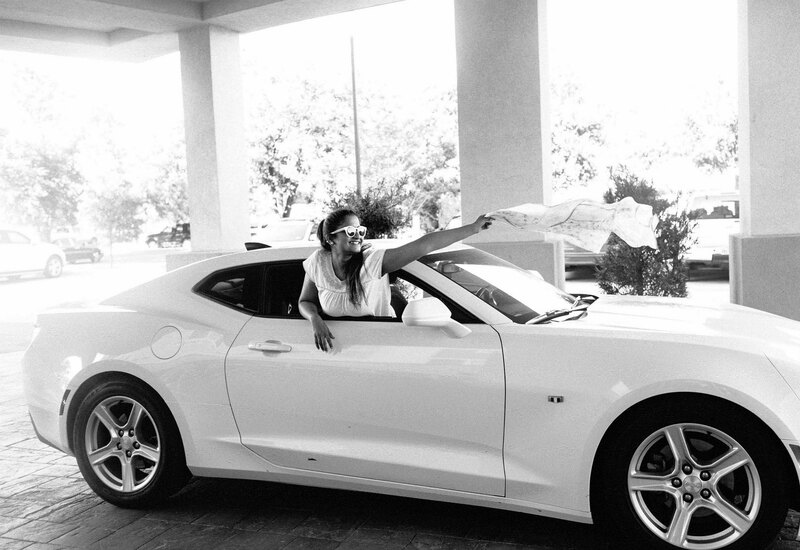 On Sunday, we drove to San Antonio to spend the rest of the day. The drive was nearly 2hrs. 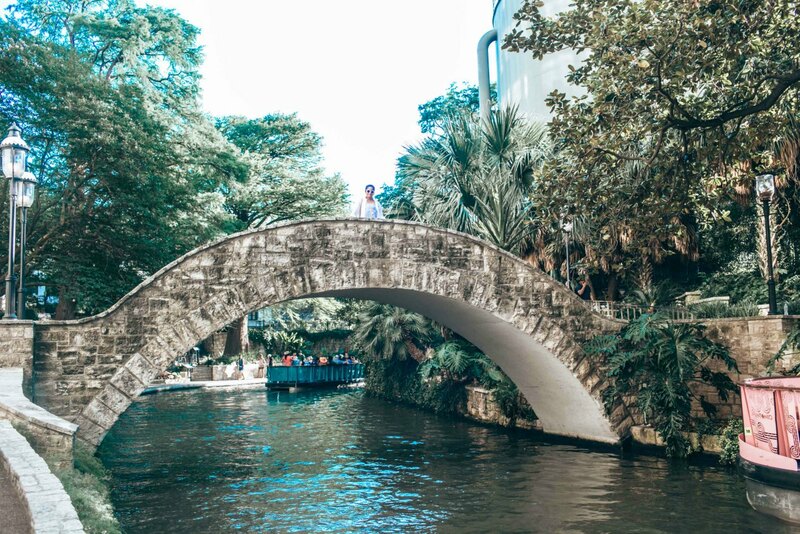 Riverwalk is a city park along the banks of the San Antonio River with paved paths, arched stone bridges, and beautiful landscapes. The boat ride tours the 15-mile riverwalk covering all historic spots and attractions. The tour guide explained the history of all the buildings, museums and status. We took the tour in the afternoon which was a wrong decision as it was very hot and we couldn’t lift our heads to look at the buildings. I would suggest taking the tour either in the morning or evening during summer. Corpus Christie is a hub for beautiful beaches. It’s a 2hr drive from San Antonio. Our plan was to reach corpus christie by late evening to witness the sunset but we couldn’t make it because it was almost noon by the time we reached San Antonio and the boot ride took a while. If you make to the San Antonio in the morning, you can cover the beach too. Corpus Christie was highly suggested by a friend, I still feel bad for not visiting it. McGee Beach on Shoreline Boulevard in Corpus Christi. We did a very good job packing all cotton and linen breathable pieces as they were perfect for the warm and humid Texas weather. Skip jeans and go for cotton/linen pants. Lightweight linen shirts are the perfect layering piece over sleeveless dresses and tops. 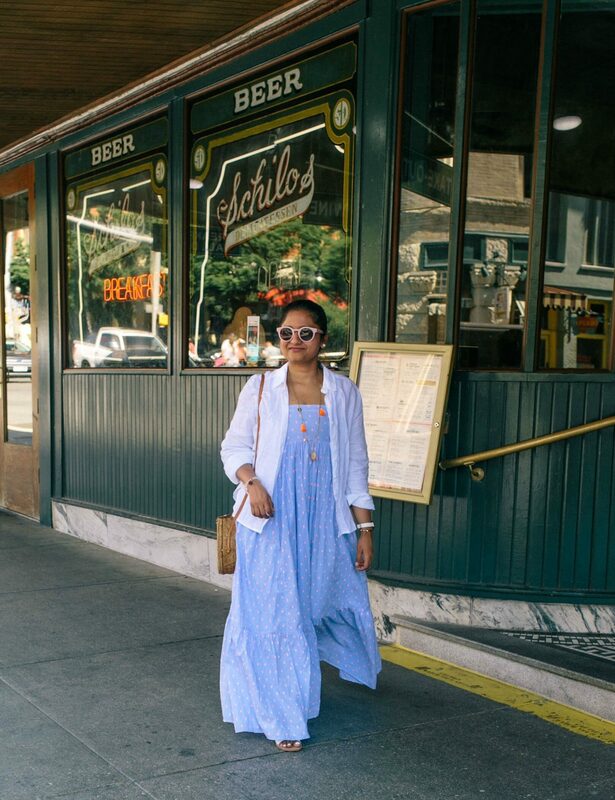 Pastel and light colors look cool in summer and elevate summer tan. 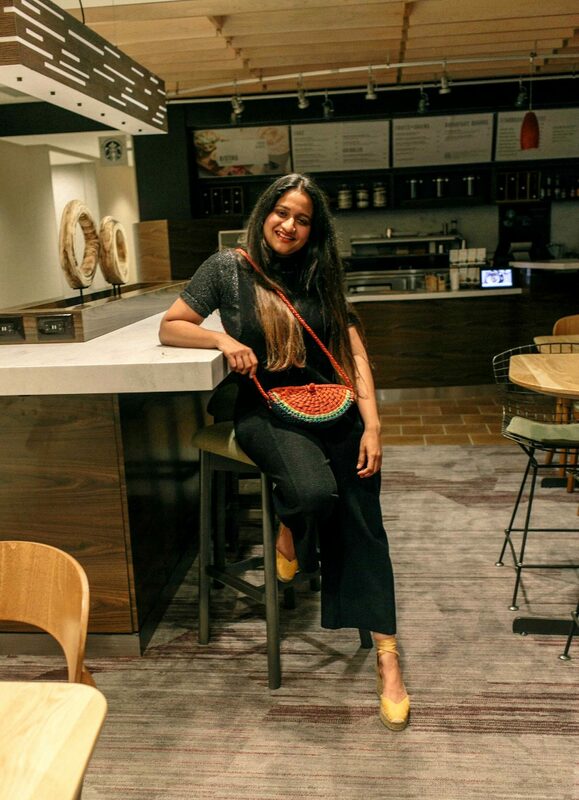 Straw bags are the trendiest and fun accessory to carry in Summer. 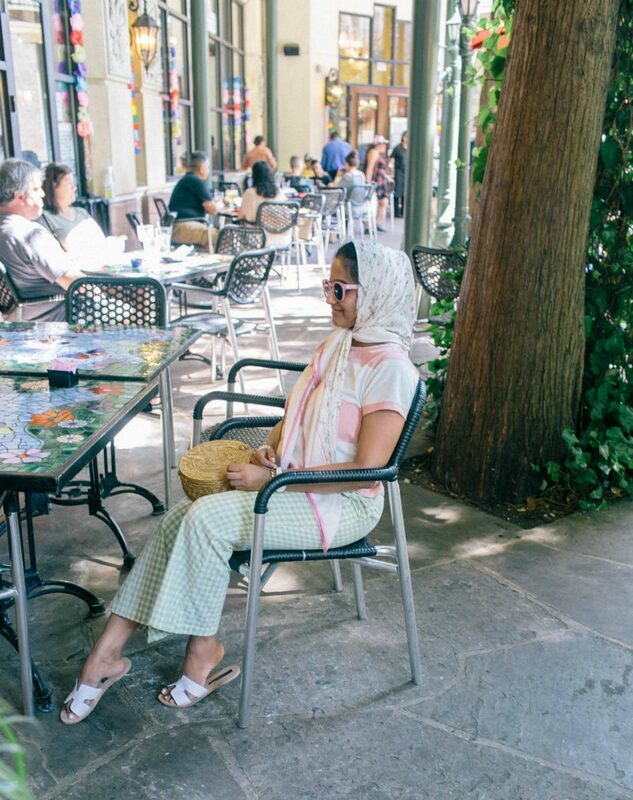 Use Bandana scarfs as hair accessories- as a headband to keep hair from falling onto face and as a headscarf to protect from harmless UV rays. Beauty tip- Wear less makeup, go for a tinted moisturizer with SPF instead of foundation because you will be literally melting and the foundation will mess up your face. 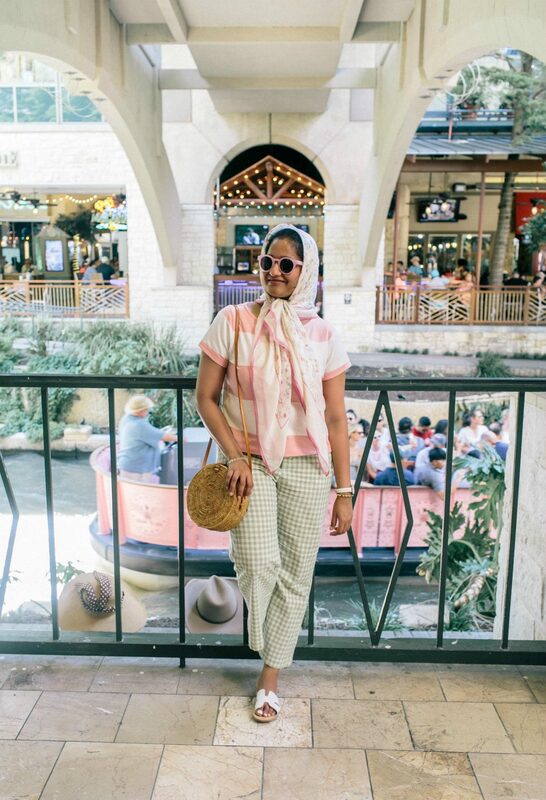 I wore this striped and gingham outfit combo to the river walk boat ride. 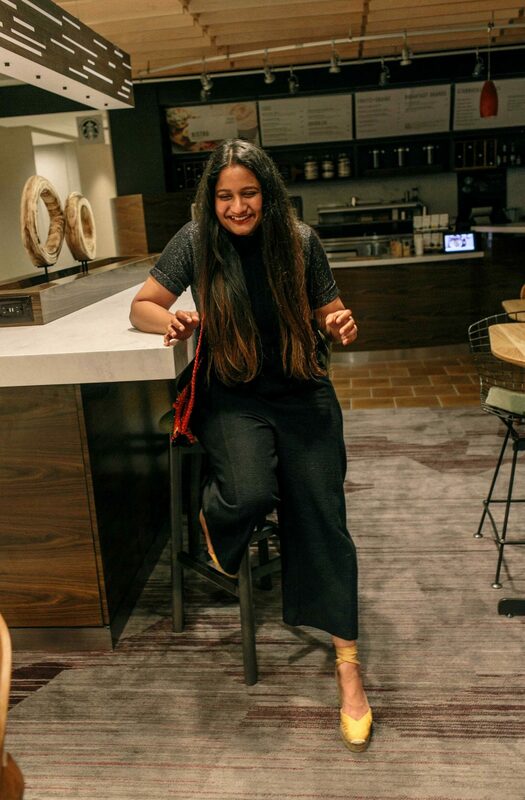 The UO pants were extremely comfortable and looked refreshing. 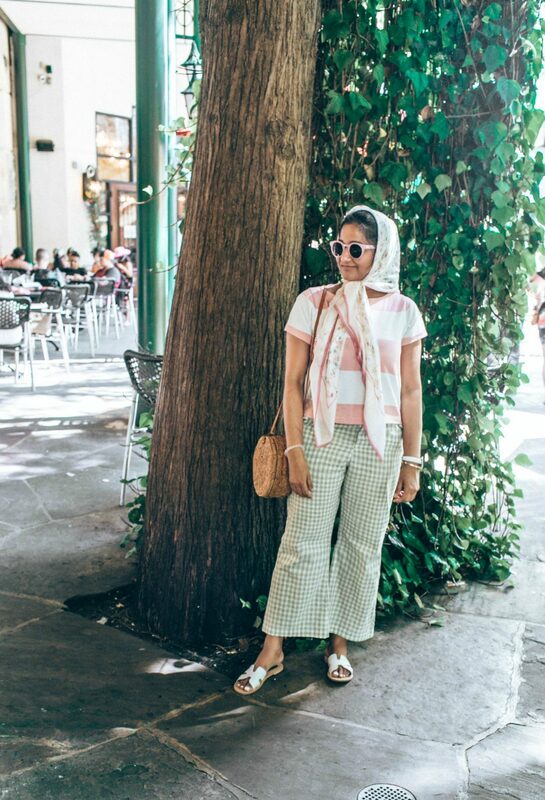 The headscarf wasn’t just a fashion accessory, it really protected me from direct sunlight during the boat tour. 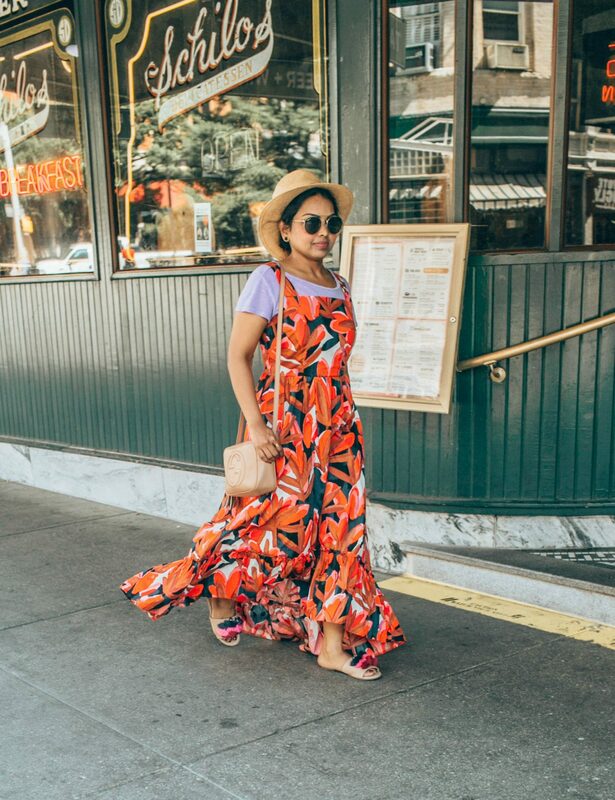 Lakki wore an orange printed dress from Target with a lilac tee underneath that I styled. It’s an unusual mix of dark and light color and if you haven’t noticed it yet, lilac is the most trending color of the season. The Raffia sandals with tassel add some texture to the outfit. 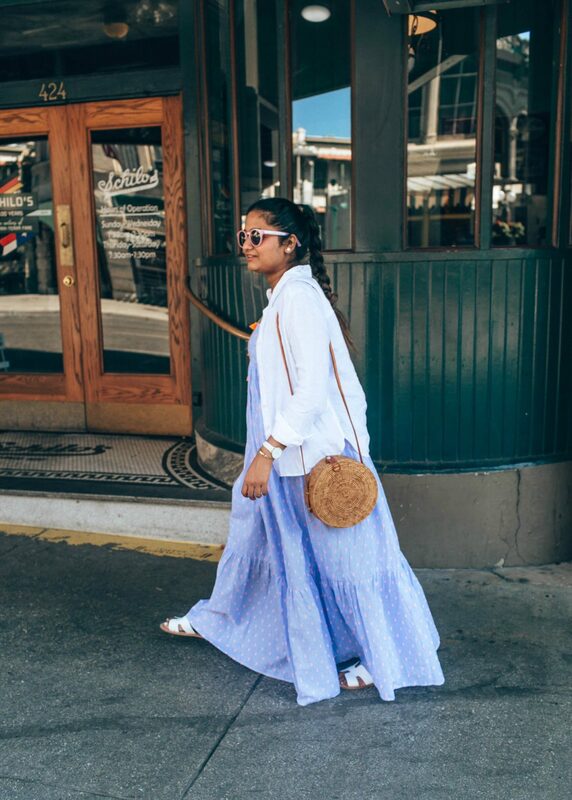 Blue and white are a classic combo for Summer. There’s something so crisp, and serene about these colors. 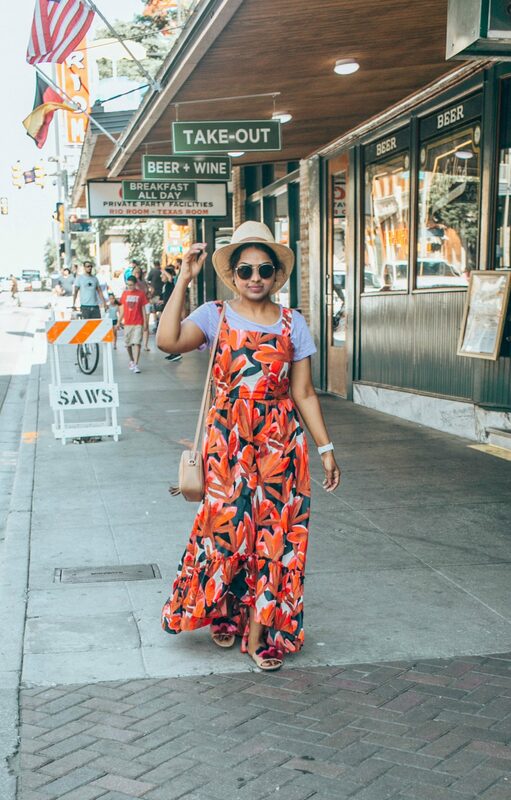 I added some color to the outfit with the pink sunglasses and orange tassel necklace. We saw this place during our Riverwalk boat tour and decided to try it. 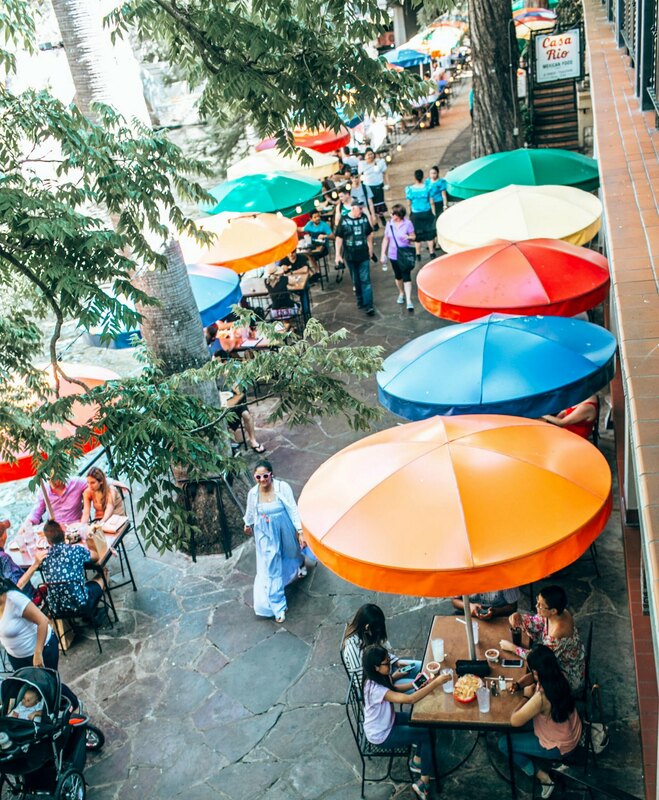 Casa Rio was the first business to ever open in the Riverwalk. It is located across the river with a magnificent view. 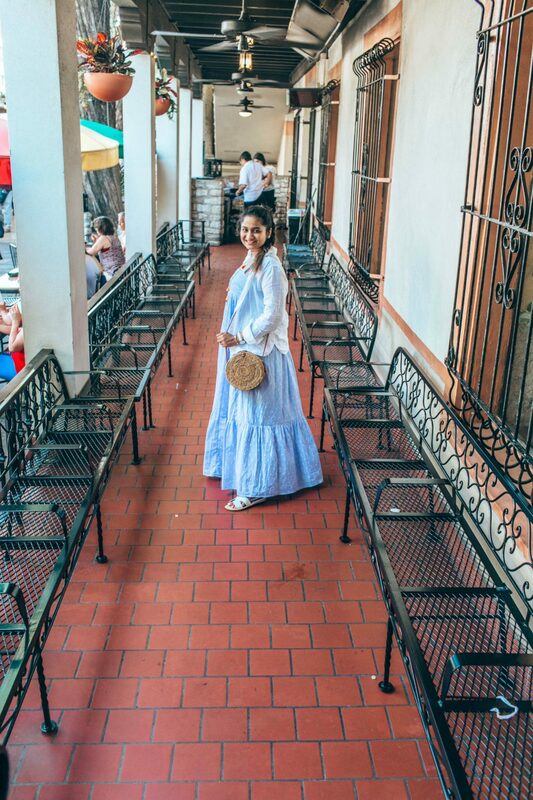 Their picturesque location combined with authentic Mexican food offers the perfect setting for dinner dates, family gathering and girlfriend outings. As for the food, it was delicious, especially the hot salsa was very tasty. I also liked my Taco Salad. On Memorial Day (Monday) we returned back to Columbus with loads of memories and gaining no extra pounds as we sweated everything we ate.